A team of scientists including a RUDN chemist has synthesized new molecules belonging to the class of calixarenes, bowl-like hollow structures. These substances appear to trap adenosine triphosphoric acid (ATP), the main source of energy in the body. The article was published in Beilstein Journal of Organic Chemistry. A team of Russian scientists including a RUDN employee was the first to synthesize calixarenes able to "catch" ATP molecules and trap them inside. ATP is a universal energy source for the majority of biochemical processes. Moreover, its molecules also play a role of an intercellular mediator. The authors of the work created a kind of a molecular sensor to recognize an ATP molecule among others and also to trap it. This is possible due to molecular receptors attached to the upper part of the bowl. The receptors are formed from groups of atoms that selectively bind only with certain types of compounds. Nitrogen-containing atom groups added by the scientists demonstrated high efficiency of binding with ATP in a solution. The scientists synthesized several types of calixarenes. The first included compounds with two or four receptors attached to the upper part of the molecule, and the second one to the lower part of the molecule. Other types contained combinations of the first two. Having analyzed the chemical properties of each type of compound in detail, the scientists identified differences in their behavior and properties. For example, when two specific groups are added to the lower part of the molecule, it starts to bind adenosine diphosphoric acid (ADP), a substance formed after partial disintegration of ATP, in a more efficient way. To determine how the newly synthesized molecule binds ATP or ADP, the chemists used the dye replacement method. They prepared solutions with synthesized molecules and added a dye called eosin Y to them. Afterward, the authors added ATP or ADP in different concentrations to the solution and compared their optical spectrums. When the acids were added to the mixes, the absorption band of the dye shifted. It meant that the concentration of the dye in the solution increased, and therefore, ATP/ADP molecules drove the molecules of the dye from calixarene receptors. This experiment showed better affinity of the newly synthesized calixarenes with ATP and ADP than with dye molecules. "In the recent two decades, many research groups focused on the synthesis of master molecules with high affinity with biologically important substances. An especially important area of this research is the recognition and transportation of nucleotides (ATP and ADP) because of their high biological value. Adenine-containing nucleotides are a universal source of energy and also act as intracellular mediators in many biological processes. 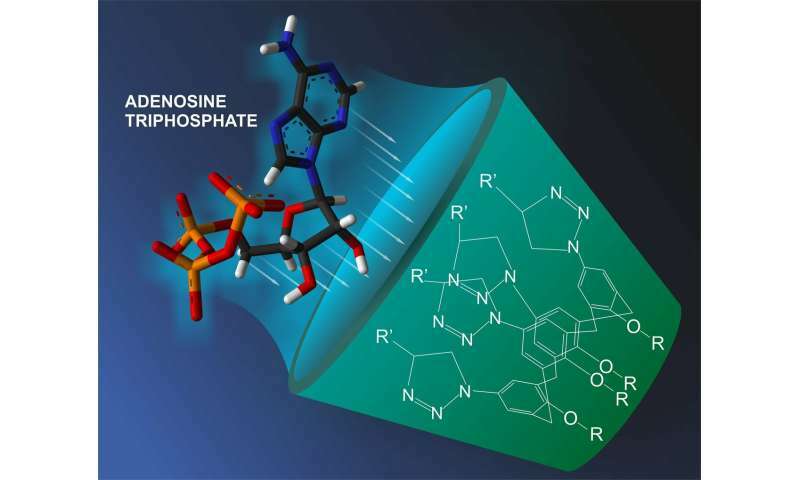 We were the first to develop calixarene-based molecules able to identify ATP and ADP in a solution and bind with them even at small concentrations," says Viktor Khrustalyov, a co-author of the work, Ph.D. in Chemistry, and the head of the Department of Nonorganic Physics at RUDN.